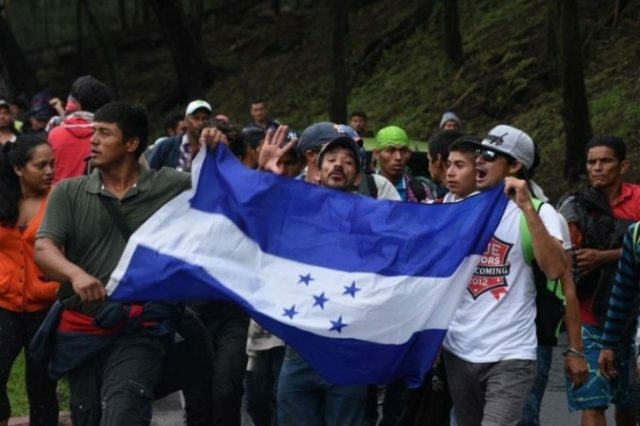 Hondurans who want to escape poverty and corruption are launching another caravan of migrants towards the Californian border, according to the Washington Post. In much the way last year’s Central American caravan originated, a flier is circulating on Honduran social media. “We’re looking for refuge,” it says. “In Honduras, we are being killed.” It advertises a 5 a.m. departure on Jan. 15 from the northern city of San Pedro Sula. Mexican officials responded by saying they will register the migrants as they head north to the United States. If the caravan departs mid-January, it is expected to arrive at the California border in early February. A caravan is forming right now in Honduras. It’s supposed to be bigger than the other caravans. We will handle that as it comes up. If we had a wall, we wouldn’t have any problems. But we don’t, so we will handle it. The Washington Post said the candidate migrants include Glen Muños. He told the Washington Post that “I’m young, and I want to know another place.” His older brother sneaked into the United States after traveling north with the 2018 caravan. Democrats are expected to welcome the caravan — unless it causes swing voters to support Trump. Business groups and mayors are also expected the welcome the caravan, which will bring them more low-wage workers and additional consumers. GOP legislators are expected to denounce the caravan, but they did little to stop the inflow when they held the majority in the House and Senate in 2017 and 2018. The caravan’s participants recognize that a U.S. border wall cannot stop their progress. Pro-migration U.S. lawyers have widely explained that the U.S. asylum laws allow economic migrants to file an asylum claim once they step on one square foot of U.S. soil, such as the U.S. half of the Rio Grande river. Once the claim is filed, most migrants are released into the United States to take jobs. Few migrants actually win asylum, but few are deported. Democrats are blocking any changes to the asylum laws or the related catch-and-release rules. They also oppose the deportation of migrants who are denied asylum. Officials at the Department of Homeland Security have developed several legal strategies to block the migrants, including a new program that would deny migrants jobs by forcing them to stay in Mexico while their claims for asylum are heard. The status of the “Remain In Mexico” program is unclear, partly because it needs cooperation from the Mexican government. DHS officials are still processing asylum claims from the migrants who arrived in the October caravan. Many remain in Mexico, and many have been allowed to apply for asylum. The department has not said how many of the migrants have been sent home, nor how many have been released into the United States pending decisions by asylum judges. Traditional rules have provided asylum to people fleeing political or religious persecution. However, deputies working for former President Barack Obama offered asylum to people who said they were fleeing gang violence or violent husbands. Former Attorney General Jeff Sessions canceled Obama’s expansion, but progressive groups have prompted a lower level judge to freeze Sessions’ reforms. Nationwide, the bipartisan establishment’s economic policy of using legal migration to boost economic growth shifts wealth from young people towards older people by flooding the market with cheap white-collar and blue-collar foreign labor. That flood of outside labor spikes profits and Wall Street values by cutting salaries for manual and skilled labor of blue-collar and white-collar employees. Immigration also steers investment and wealth away from towns in Heartland states because coastal investors can more easily hire and supervise the large immigrant populations who prefer to live in coastal cities. In turn, that investment flow drives up coastal real estate prices, pricing poor U.S. whites, Latinos and blacks out of prosperous cities, such as Berkeley and Oakland.